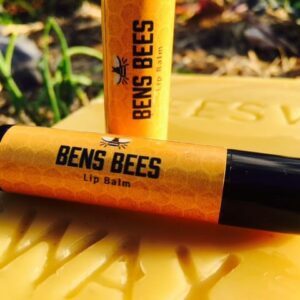 Protect and preserve furniture with Ben’s Bees Beeswax Polish, made from organic beeswax, olive oil and jojoba oil. Suitable for use on wooden furniture, leather products and raw timber such as kitchen chopping boards. Using a dry, soft cloth buff until beeswax polish is worked into the surface. Repeat polish every two months. Cooks get it: the chopping board is an essential item, kind of primitive, the most used and abused tool in the kitchen. It might sound a little strange, to fawn over a slab of marble, wood or (heaven forbid) plastic, but a chopping board really is the cornerstone of any meal. And so, as an ex-chef and lifelong foodie, what chopping board do I prefer? Wooden of course, heavy, rounded on the edges, made to last, made by hand, the best option for your knife collection—it’s an all-round winner. I have chopping boards I bought at farmer’s markets twenty years ago (but this doesn’t seem to stop me adding another to my collection every now and again!). There is a certain pleasure in owning good natural items, and even more pleasure in looking after them. Slow living is about taking the time to do everyday activities with care; this can calm the nervous system and help you feel more centred in your life. This aspect of mindfulness is especially true in the kitchen, where making food is the perfect activity for promoting creativity, relaxation and healthy living. So, how do you look after a cook’s best friend, the humble chopping board? Beeswax of course! 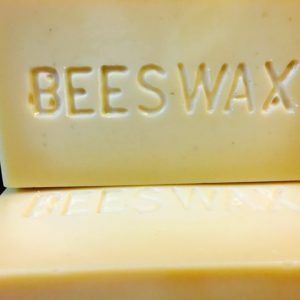 Beeswax is an all-natural product that comes from our favourite friend, the honey bee. It is a natural wax made by our friend, the honey bee, formed into scales from eight wax-producing glands in the abdominal sections of female workers, who discard the wax in the hive. Hive workers then collect and use the wax to form cells for honey storage and larvae protection. Chemically speaking, beeswax is made mainly of esters of fatty acids and various long-chain alcohols. 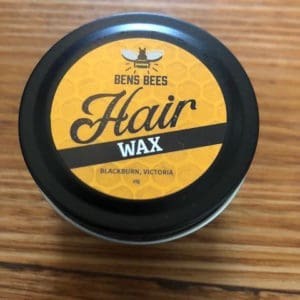 And this natural wax has a plethora of perks and properties that make it the perfect substance to prime and protect your wooden kitchen chopping board. 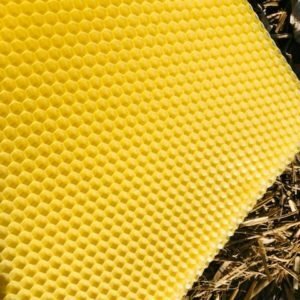 Historically, beeswax is considered the first plastic. It was the original lubricant and waterproofing agent. Beeswax has an inherent antibacterial property, meaning that is works hard to keep things clean and reduces the risks of contamination. Beeswax is food safe, and while it might not taste great, it is completely non-toxic and safe to ingest, making it an excellent substance for use on kitchen products. Finally, thanks to the wonder of propolis—a mixture of tree resin and wax flakes, made by bees—beeswax never goes off and provides an antiseptic coating. Now that’s a lot of good features! 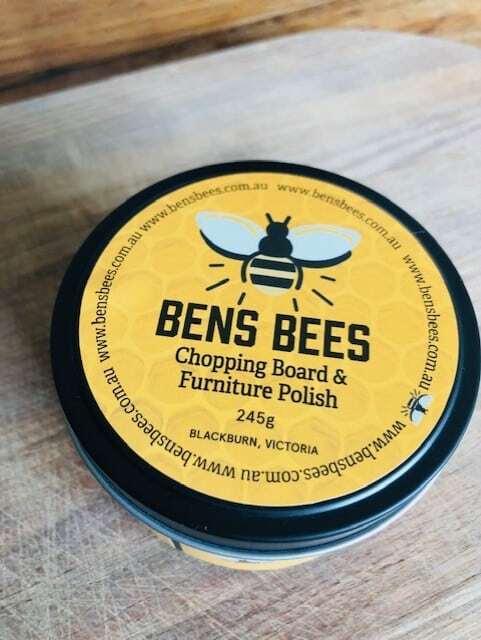 Ben’s Bees Beeswax Chopping Board and Furniture Polish is a natural product made from organic beeswax, olive oil and jojoba oil. Suitable for use on wooden furniture, leather products and raw timber, such as kitchen chopping boards, it works hard to protect and preserve your favourite kitchen tool. Just apply your polish using a dry, soft cloth and buff until beeswax polish is worked into the surface. Repeat polish every two months and your chopping board will be protected from moisture and ready for you to cook up a storm.